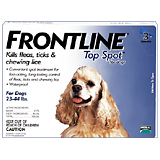 FRONTLINE PLUS FLEA CONTROL & FRONTLINE TOP SPOT Frontline Top Spot has fipronil as its main ingredient while Frontline Plus Flea Control combines fipronil and methoprene. Not only does it kill the adult flea but also flea eggs and larvae, effectively breaking the life cycle and thus further fleas from developing. Both of the products also kill ticks like the ones who can transmit Lyme disease and Rocky Mountain Spotted Fever. It kills fleas and ticks for at least one month and controls and treats flea allergy dermatitis. It is waterproof and your dog can get wet between applications without any of the effectiveness being lost. It can safely be used on puppies older than 8 weeks. 98 to 100% of adult fleas are killed within 24 hours of application. Both products are available without a prescription with Frontline Top Spot Dog Flea & Tick Control costing around $9 per dog per month. Frontline Plus Dog Flea Control around $11 per dog per month. It is important to take the weight of your pet into consideration to determine the correct dosage. When buying online, some suppliers offer Frontline Control free shipping. Although side effects are not common, as with all medications there is always a possibility that it may occur. Even allergic reactions could occur in some dogs. Consult your veterinarian immediately if you suspect that your dog is suffering from side effects or an allergic reaction. Vomiting and diarrhea or irritation of the skin could be indications that not all is well. It is important to ensure that products for dogs are only used on dogs. By using products meant for cats on dogs or vice versa, you could cause harm to your pet in the process. Using common sense and taking precautions by avoiding direct skin or contact with the eyes should make application a breeze. Apply Frontline Plus Flea Control products directly to the skin between the shoulder blades for effective flea and tick control. Wash hands after application and discard empty containers so that it cannot be licked or chewed by animals.